A magnitude-7.6 earthquake shook the Kashmir region, which is shared by India and Pakistan, on Saturday morning, Oct. 8. In the hours and days that followed, more than a dozen major aftershocks continued to shake the region, including a magnitude-6.2 event two hours after the main temblor. A magnitude-7.6 earthquake (the largest yellow square in the image to the right, from 4 p.m. universal time on Oct. 10) shook Pakistan on on Saturday morning, killing more than 20,000 people in the Kashmir region. Aftershocks followed, including one magnitude 6.2 and many larger than magnitude 5 (some are represented here by smaller yellow boxes). Image is courtesy of U.S. Geological Survey. As rescue workers finally arrived at remote villages in Kashmir's Himalayan mountains on Monday, the reported death toll surpassed 20,000 people. Only handfuls of survivors have been pulled from the rubble so far, according to The New York Times. Local people are struggling to remove rubble with their hands and pickaxes, insufficient against concrete and other building materials, according to National Public Radio. In the meantime, communities lack basic needs such as water, food and shelter, as they wait for help from the government. In many places, help did not arrive until today, and others have yet to receive military or other assistance. In Kashmir's capital of Muzaffarabad, about 10 kilometers (6.2 miles) southwest of the epicenter of the main earthquake, looting broke out on Monday, according to Reuters. Responders and locals are anticipating that they will have shortages in medicine, in addition to food, water, and shelter. In many Kashmir villages, earthquake-triggered landslides and mudslides funneled down tight valleys, causing houses to slide down hillsides and crush others below. "Not only do they have the problems of Iran or Afghanistan  [large] earthquakes and mud homes  but they are located in northern Pakistan in very narrow steep canyons," says Brian Tucker of GeoHazards International, an organization that works to bring earthquake-safe-building practices to hazardous regions, particularly to schools, which were hard hit in this event. "They live at the bottom of these very, very steep canyons, so that earthquake-triggered landslides are common." Tucker recalls seeing buildings that were unscathed by earthquake shaking but damaged by subsequent landslides, while flying over the region by helicopter in 2000. He says that "no one should think that a new edition of a building code is going to make a difference." The country also needs more people with the knowhow to make and enforce such codes. In contrast to the number of earth scientists and engineers in Iran and Turkey, for example, he says that Pakistan has a dearth of such professionals. For the immediate response to this most recent disaster, Pakistan's president Musharraf accepted direct assistance from foreign earthquake response teams, in addition to financial assistance from several countries (various countries' embassies offered funds), including the United States. President Bush offered $50 million and several helicopters. India's offer of assistance remains delicate, as the two countries have had rocky relations over ownership of the Kashmir region. Reports of deaths from the Indian side of Kashmir remain in the hundreds (around 865, according to The New York Times), though news reports have speculated that those numbers will rise if emergency response teams can eventually get to the region, which is heavily patrolled by India's military and has experienced internal violence between Muslims and Hindus. 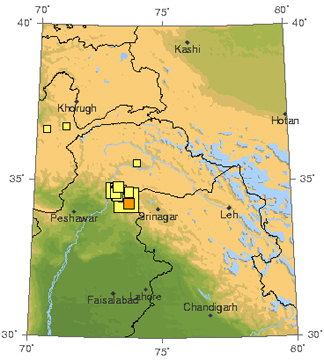 The Kashmir region is extremely tectonically active. The collision of the Indian subcontinent into Eurasia  traveling north at the fast pace of 40 millimeters (1.6 inches) a year  formed the major and active thrust faults in the region, which consistently rupture in large earthquakes.